BlackBerry Bold 9780 launching on T-Mobile November 17? | BlackBerry Blast! BlackBerry Blast! > News > BlackBerry Bold 9780 launching on T-Mobile November 17? BlackBerry Bold 9780 launching on T-Mobile November 17? 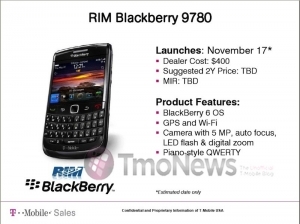 The BlackBerry Bold 9780 is apparently going to launch on T-Mobile on or around November 17. TMoNews got their hands on an internal slide that mentions the launch date, although there is an asterisk next to it. The T-Mobile Bold 9780 will run BlackBerry OS 6, on a 624MHz processor. It will have a 2.44 inch HVGA+ display with a resolution of 480 x 360. It comes with 512MB of RAM, a 5 megapixel camera, 3G, WiFi, UMA, and Bluetooth 2.1. The design is basically like the 9700 and is a nice refresh for the popular BlackBerry Bold.